This entry was posted in Church History, Dogmatics/Systematic Theology, Early Church, Medieval Theologians and tagged Augustine, Council of Valence, Fulgentius of Ruspe, Gottschalk of Orbais, Gregory of Rimini, Gregory the Great, Hincmar of Rheims, Isidore of Seville, Prudentius of Troyes, Rabanus, Ratramnus of Corbie, Remigius. It is tragic that Gottschalk’s views were treated as deviant by the church authorities from the very beginning of his service. 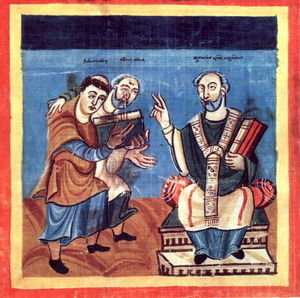 Established court theologians, such as Eriugena, actually published much more questionable theories, but faced no persecution, unlike Gottschalk.